Employees can become ill and can be involved in accidents. It is a reality of life. Hopefully, they recover within a short time to resume their normal work duties. However, they may be incapacitated in such a way that they are no longer fit, healthy or capable to do the work required from them. In such circumstances, ending the employment relationship for medical incapacity may be an avenue available to an employer. Employers are not expected to keep a sick or incapacitated employee’s job open indefinitely. However, the dismissal of a sick or incapacitated employee must be substantively justified and procedurally fair. 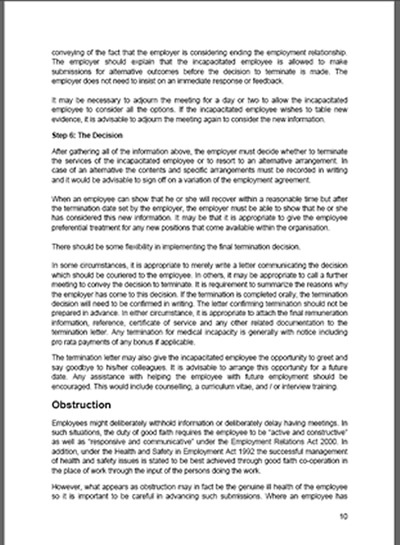 This eBook provides employers with the steps required to deal with this situation.